Kimba fans (especially in Japan) don't seem to have luck in playing with their favorite white lion on their computer or TV screens. So far there were 2 attempts (in Japan only) of making a Jungle Emperor/Kimba video game, but unfortunately both of them have failed. 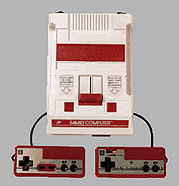 Compared to this, AstroBoy video games for already 4 different videogame systems (FC, SFC, PS2, GBA) have been developed from 1988 to date, and two of them were released in the U.S. This state could have been changed in the previous years, but nothing new was done, and it's to see what will happen next. The first video Kimba/Jungle Emperor game project was started in the mid-80s, and it was developed for the Nintendo Famicom (Family Computer), the 8-bit Nintendo video game console introduced in Japan in 1983 that was released in the U.S. as the Nintendo Entertainment System (NES) in 1985.
based on the 1989 "Jungle Emperor" series. It is known is that this was developed by Taito and that it was planned to be a platform game (the Japanese websites also mention that it was supposed to be an action game with horizontal scrolling). Taito has issued in 1990 a booklet titled "Preview - Pick up preview of Taito new games" which featured Kimba on the cover page, and an announcement with several screenshots of that game inside the booklet. Because of all this, it is believed that this game was almost complete at the time when it was cancelled. Since it is said that Taito has been doing many great games for the Famicom, this could have been a good game as well. What went wrong? The next and so far the last Jungle Emperor game project was started by Nintendo in the mid-90s for the Nintendo 64 video game system. Mr. Shigeru Miyamoto (the creator of Mario) with his team of programmers and of course Tezuka Productions (now owned by Mr. Makoto Tezuka, the son of Mr. Osamu Tezuka) were involved in this project. 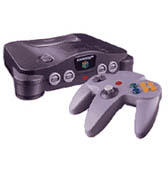 In the beginning the game was announced to be released on an 128-meg cartridge, and later was mentioned that an add-on for this game will be available for 64 DD, the disk drive system for the N64. The game had its first on-video appearance at the 1996 Tokyo Shoshinkai Show, after which the game was announced to be released in spring 1999. A little bit later only a few scenes from the game were shown at the Nintendo Space World in 1998. The game looked great at that time, and it seemed that this game project will finally take off. However, later that year in an interview made on 1998's E3, Mr. Miyamoto mentioned "that the project is in a bit of trouble and may take longer to complete than originally expected, mainly because the producer doesn't have much experience with creating games". This seemed to be an indefinite hold (since the license for the Jungle Emperor is very expensive in Japan, it was believed that Nintendo might still continue with the development of this game) but it was unfortunately soon followed by the cancellation of this project. According to the official announcement from Sega of Japan from May 2002, in 2002 Sega acquired the worldwide rights until 2009 from Tezuka Productions to make video games based on nearly 700 works by Mr. Tezuka, including Astro Boy, Jungle Emperor, The Phoenix and Black Jack. It was also said "that the games are going to be developed for home video game systems, arcade games, PC and other hardware". As a result, Astro Boy made it again to the video game consoles (previously it was developed by Konami for the Famicom in 1988 and by Zamuse/Banpresto for the Super Famicom in 1994): it has been released in Japan for the PlayStation 2 in March 2004, and for the GameBoy Advance in December 2003. Both games have been released in the U.S. on August 17, 2004. The GameBoy Advance version had also 3 cameo appearances of Leo/Kimba, but that was all we could see of him. Dororo, another game based on Tezuka's work of the same name was also released for the PlayStation 2, but a little later - in Japan on September 9, 2004, and in the U.S. under the title "Blood Will Tell" on September 21, 2004. After the Astro Boy and Dororo game projects have been successfully launched, Kimba/Jungle Emperor might have been the next game project based on Mr. Tezuka's works made by Sega, however until the end of the acquirement in 2009 nothing else was done. According to a rumor from May 2003, Nintendo tried to develop the Jungle Emperor game (it was said the game will be developed for the Nintendo GameCube). It was said to be developed by the same crew that worked on the N64 version (Mr. Miyamoto's team of programmers and Tezuka Productions), however there was nothing done about it. Another rumor on the same topic was out that the Jungle Emperor video game for the Nintendo GameCube might have been developed by a less-known Japanese company called Pax Softonica (パックス ソフトニカ) for which is said that it previously developed several video games for Nintendo. Some of these games are: "Tennis", "Balloon Kid" and "Moguranya"/"Mole Mania" for the Nintendo GameBoy, "Donkey Kong" for the Super GameBoy, and the "Hamtaro" game series for the GameBoy Color and GameBoy Advance. Pax Softonica was established in Yokohama in 1983 and was developing games for microcomputers like Fujitsu FM-7, MSX, Sharp PC-8001 and Sharp X1 before developing videogames for Nintendo. Probably the reason why Pax Softonica was expected to be working for Nintendo on the Jungle Emperor game project for the Nintendo GameCube is an interesting info that Pax Softonica took part even in the development of the cancelled "Emperor of the Jungle" game for the Nintendo 64, but it wasn't officially mentioned and credited as one of its developers. The release of the 2009 remake of the "Jungle Emperor" movie was another chance for the Kimba/Jungle Emperor video game to be done, however, aside from the small desktop games (like the desktop clock or the jigsaw puzzle with scenes from the movie) nothing else was done. The 2015 marks the 60th anniversary of the first publishing of the Jungle Emperor manga, so I hope that Leo/Kimba fans will finally be able to enjoy playing with their favorite white lion on their computers/video game consoles around that time. Let's keep our fingers crossed!